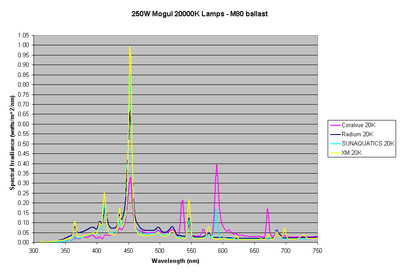 Continuing with data from the spectral analysis of 250W Mogul base lamps presented in Part I [Ref. 11], this article presents the data on the remaining nine 250W mogul base lamps along with the comparison of all the 250W mogul lamps. 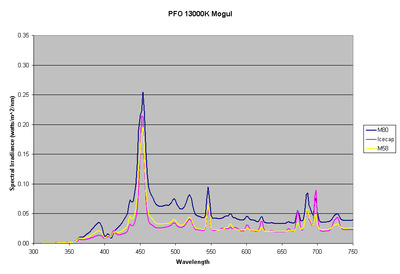 Figure 11: Spectral Plot of the PFO 13000K lamp on different ballasts. 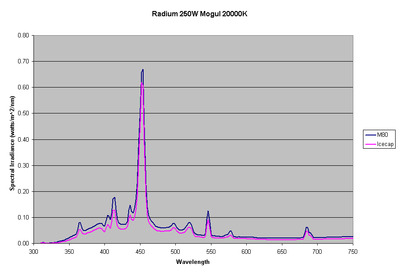 Figure 12: Spectral Plot of the Radium 20000K lamp on different ballasts. Figure 13: Spectral Plot of the Sun Aquatics 10000K lamp on different ballasts. 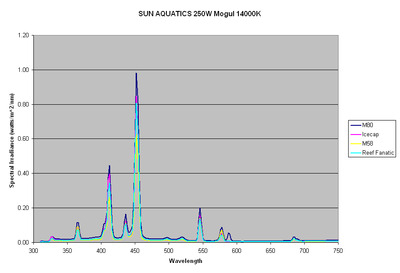 Figure 14: Spectral Plot of the Sun Aquatics 10000K lamp on different ballasts. 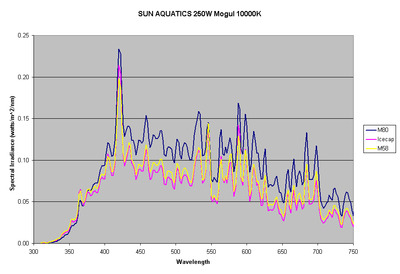 Figure 15: Spectral Plot of the Sun Aquatics 10000K lamp on different ballasts. 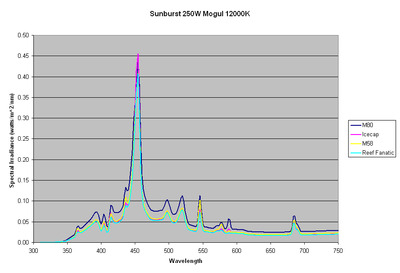 Figure 16: Spectral Plot of the Sunburst 12000K lamp on different ballasts. 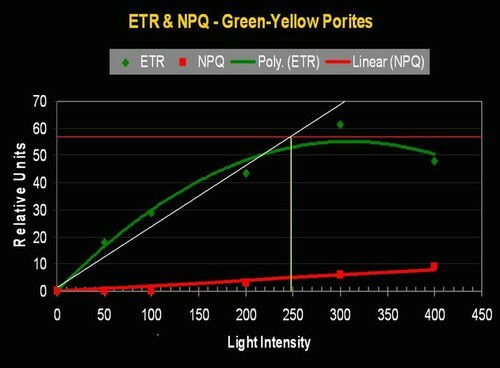 Figure 17: Spectral Plot of the Ushio 10000K lamp on different ballasts. 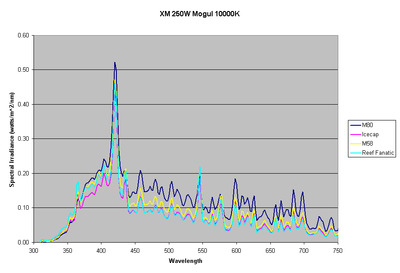 Figure 18: Spectral Plot of the XM 10000K lamp on different ballasts. 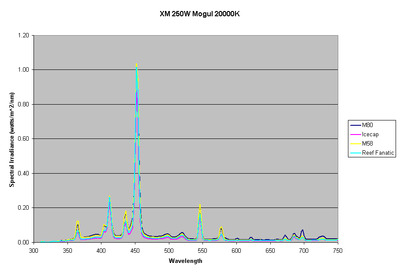 Figure 19: Spectral Plot of the XM 20000K lamp on different ballasts. Figures 20,21 and 22 show a comparison of all of the lamps. 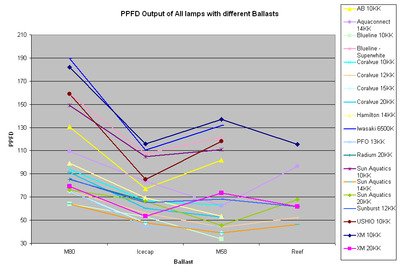 Figure 20, provides a comparison of these lamps when used with different ballasts. As seen from this figure, the Iwasaki 6500K has the most PPFD independent of the ballast used. For all lamps, the M80 ballast sold in the hobby as the “HQI” ballast had the highest output, but at the cost of more power. Whether this is detrimental to the lamp life is yet to be established. 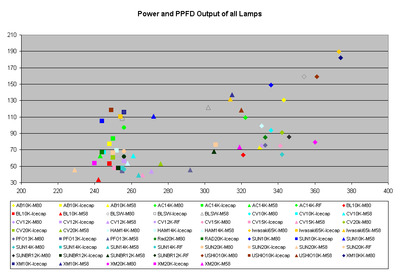 Figure 21, shows the plots of power consumption and PPFD for all the lamp ballast combination tested in this article. Figure 22, 23 and 24 show the superimposed spectral plots of the lamps. As seen from the data and plots, there is wide variation among the lamps and the use of CCT to designate the lamps is pretty much meaningless given that the spectral plots are often very similar yet the lamps are being sold with different color temperatures. Hopefully this article will help the aquarist in separating fact from advertising hype !! Once again the usual disclaimer applies – this data is based on a sample size of one, and we have no idea what the variation is within lamps. How long these lamps retain their PPFD output remains to be seen. As seen from the data, the Reef Fanatic electronic ballast is very similar to the Icecap Electronic ballast in terms of lamp output and power consumption, based on the 5 lamps tested with this ballast. Further comparison with the 250W DE Lamps [Ref. 9 and a forth coming article] will reveal that there is no justification for the sweeping statement “250W DE lamps have more PPFD output than 250W Mogul base lamps”. We would like to thank several people whose help made this study possible. Joe Burger for sending me all the lamps that he used in his tests. Patrick at PFO Lighting, Brian at HelloLights.com, Perry at Sunlight Supply, Venki at Sun Aquatics, Ed at Aquaconnect, Andy at IceCap and Bob at Reef Fanatic. Finally, we would like to thank Dr. Paul Walker of Penn State University for the use of the spectroradiometer and dark room for testing the lamps. Errata 2004-08-19: Table 19 and 20 updated with correct data. Figure 18 and 19 updated with correct figures. Joshi, S. 1998. Spectral Analysis of Metal Halide Lamps Used in the Reef Aquarium Hobby Part 1: New 400-watt Lamps, Aquarium Frontiers, Nov 1998. Joshi, S. and Morgan D. 1999. Spectral Analysis of Metal Halide Lamps used in the Reef Aquarium Hobby Part II: Used 400-watt Lamps, Aquarium Frontiers, Jan 1999. Joshi, S. 2002, “Spectral Analysis of Recent Metal Halide Lamps: Part IV- 10000K and 12000K lamps,” 2002 Annual Marine Fish and Reef USA, Fancy Publications. 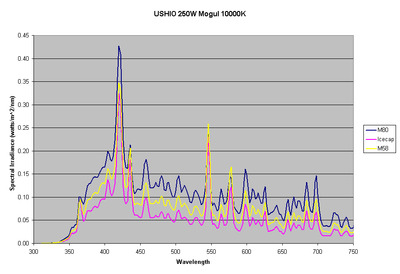 Joshi S. More Spectral Analysis of 150W DE Metal Halide Lamps, Advanced Aquarist, May 2004. 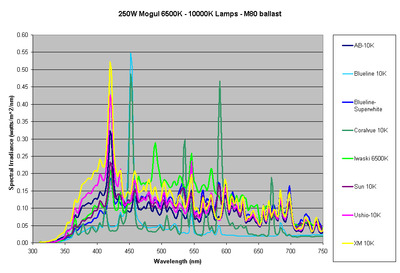 Joshi S., Spectral Analysis of 250W Mogul Base Lamps-Part I, Advanced Aquarist, July 2004.